Completing heavy lift machinery moves using our vast range of cranes. Loading/offloading of machinery and transportation. Soft strip out for refurbishments, strip out of secondary steelwork (including railings etc.) and strip out of industrial machinery. Flexible working hours - we are able to work any day of the year at any time. Plus the advantage of any of our other services such as machinery removal, relocation, transportation and storage. What is our machinery strip out service? 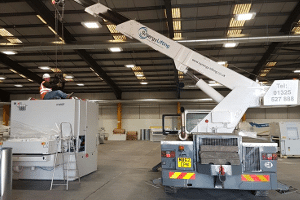 Whether you are looking to strip out a single machine or an entire factory, Synergy Lifting provide an efficient service which utilises safe working methods to get the job done on time and at an affordable price. We recognise that machinery strip outs are often followed by machinery replacements so our machinery installation service goes hand in hand with our strip out service too. Our machinery strip out service is available throughout the UK. Why choose our machinery strip out service? With years of experience carrying out machinery strip out projects, Synergy Lifting know exactly what needs to be done and the best method to do it. Our experienced labour coupled with our specialist plant and equipment means we can provide a one stop shop for machinery strip out services at an affordable rate. Combined with our machinery installation, machinery transport and machinery storage services, Synergy Lifting provide a convenient solution.